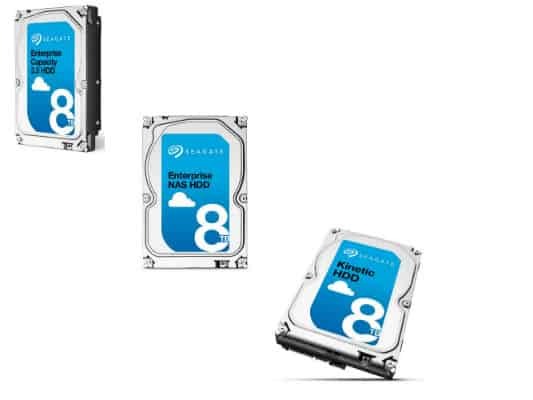 Seagate Technology has unveiled its new portfolio of 8TB capacity drives – the Seagate Enterprise Capacity 3.5 HDD, Seagate Enterprise NAS HDD and Seagate Kinetic HDD. The new drives provide small and medium sized businesses and large enterprises with the world’s highest capacity, most reliable, and highest performance storage solutions available, all optimized to match the unique storage requirements for each market segment. Within the cloud and traditional enterprise markets, businesses need high capacity and extremely reliable data storage solutions. Seagate’s 8TB Enterprise Capacity 3.5 HDD drive addresses these needs by incorporating proven conventional magnetic recording hard drive technology, backed by nine generations of data center innovation. Enterprise customers also want world class performance from their storage solutions and the 8TB Enterprise Capacity 3.5 HDD delivers for them with a 100 percent increase in random read/write performance compared to previous generations, driving a vast improvement in IT performance across the enterprise. Small- and medium-sized businesses require high reliability too, but they also need storage solutions that can scale to support enterprise class performance as business mandates change and the company grows. Seagate’s 8TB Enterprise NAS HDD takes conventional hard drive recording technology to the next level by providing one third more storage density for any tower or rack mount solution compared to the previous 6TB generation drive. This density advantage translates to fewer drives without sacrificing capacity, reducing power consumption and saving valuable space in servers and data centers to help improve IT cost structures and service value to the organization. For organizations making the transition to the cloud with an eye to leveraging open source innovation, the 8TB Kinetic HDD focuses on total cost of ownership (TCO) by emphasizing scaled-out storage and rapid deployment in data centers. In cases where archiving data is a priority, emerging technologies such as Shingled Magnetic Recording can be of strategic and business value. Combined with the Kinetic Open Storage platform, this storage solution can change the TCO equation. The platform reduces TCO by redefining and greatly simplifying storage architectures for today’s use-case scenarios. By combining an open source object storage protocol with Ethernet connectivity, Kinetic HDD eliminates multiple layers of legacy hardware and software infrastructure with a simple Key/Value interface. This in turn eliminates or dramatically reduces the need for traditional storage servers reducing capital equipment costs, power consumption and human expenses associated with managing storage for a total savings of up to 70 percent.